David asked: How do you make sense of this? But G-d is everywhere, why does Moshé imply that He is high up and not here with us? Gutman's response: Hashem fills and surrounds all…He is everywhere… so how can He have an abode? So then why do we come to the Kotel to pray? Why is it that wherever we are, all over the World, when we pray we face Jerusalem? We do this because here in Jerusalem, and particularly the Temple Mount, Hashem makes His Presence easier to recognize. He hides less here than anywhere else in the World. He does this to draw us to the teachings of this place, His holy Torah. G-d is everywhere and He is all, but the way we address Him will determine our mindset, our experience when we pray and think of Him. When we call G-d "our Father" we should feel differently than when we call Him "our King." 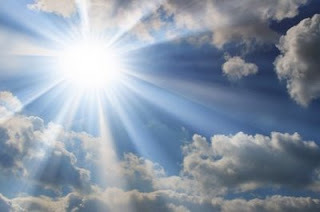 We often think of Hashem as being in Heaven. We do this to elevate our thinking toward the upper worlds. During one of the prayers of Kedusha[iii] we say that the angels ask one another, "Where is the place of His glory to adore Him." This is to direct our thinking higher and higher trying to recognize and experience even a tiny ray of His wondrous glory. In the wilderness, when we were about to begin another leg of our journey Moshe would say, "Arise Hashem and let Your foes be scattered…. "[iv] Does Hashem rise up? Not in the way a person does. "Rise up" when referring to Hashem in this way means to have His will manifest and directed to scatter our enemies, not that He literally rises up or lies down. What then is the "abode" of Hashem? In the sense of this line in the Torah it is the "place" above (before) creation where Hashem is not hiding. We want His blessings to come to us undiminished by His hiding Himself as He does in this lower world. Many times, Hashem reminds us that He is with us. All these are metaphoric terms used to bring our awareness to higher and higher spiritual realms trying to direct our consciousness to the Glory of Hashem. Thank you very much R.Locks. I get it.